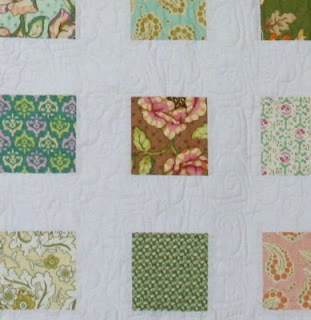 If you are at all into quilting, you have no doubt seen other blogs that are participating in Amy@Park City Girl's online quilt show. When I first saw news of it, there were about 40 participants. Later in the afternoon, when I had time to sit and go through all the entries, there were about 160. Now there are over 400! I love being able to click through to all the beautiful inspiration, especially now that I have deleted most of the quilting blogs from my Google Reader feed. This morning I decided to join the fun, so here is my entry: My HB quilt. This quilt got me excited about using more white in my quilts. Up to this point, I had a different style of quilt that I made. Maybe I spent one too many gloomy days in Indiana, and needed the lift that white can give you! I really love this quilt! I love the colors and fabrics (Heather Bailey's Freshcut). I loved that I didn't have to think, and mix and match different fabrics. I just bought a charm pack of fabrics, and started sewing! I love that it is light and airy, and best of all, I love that it is completed. Bound, washed, and soft and cozy. It got lots of use this past winter! Very pretty colors. Like the simplicity of the layout. I like the effect the white gives. I have never used much white in a quilt, but I'm starting to change my mind about that. Nice job. Love your quilt! Heather Bailey's fabrics are so beautiful. I really like the white sashings. Thanks for sharing about it. What a simple, yet beautiful, way to use those charm blocks. They don't get lost in an overall design, but rather make up a very pretty quilt. Good job. very pretty, ginger. i love the white. it makes the colors pop. that is so pretty. it looks like a wall of windows with colorful flowers visible on the other side. I LOVE white quilts! Very nice....I love white in quilts...so classic and timeless...great work! it is a beautiful quilt and turned out very nicely. i'm not much of a heart person either, but the quilting is beautiful. 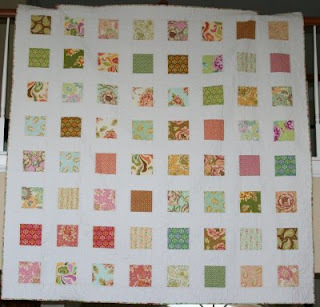 Terrific quilt, I love the colour contrasted with that wonderful bright white, great job! It's beautiful! It reminds me of another quilt your mom quilted and put up on her blog, and that one was probably my favorite of the ones she done. It was my inspiration for the fabrics I bought to make Gracie a quilt. I'm not quite sure when that will get done, but when it does, it will be very similar -- beautiful fabric squares in a lot of white/creamy white. I too love the effect of that the white gives. Beautiful quilt. 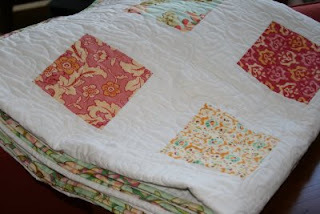 I love that quilt Ginger -- so fresh and springy! I have yet to make the white quilt jump -- but it's on my to-do list! I love this! I've done a few like this myself, they're fast and easy with the charm packs and they're very visually pleasing. Very spring/summer-ish! Ginger, That quilt is just Beautiful. I love how simple and stunning it is. Your so talented. Your mom did a great job on the quilting. Thinking of you..
the fabris are bright and bold enough to be highlighted by the white. Love it. The colors are much brighter in color than the photo shows, and look good in contrast with the white fabric. This is so beautiful! I love Heather Bailey's freshcut too. I love this quilt. Great colors and pattern. It also looks huge. Nice! The squares really highlight each fabric.